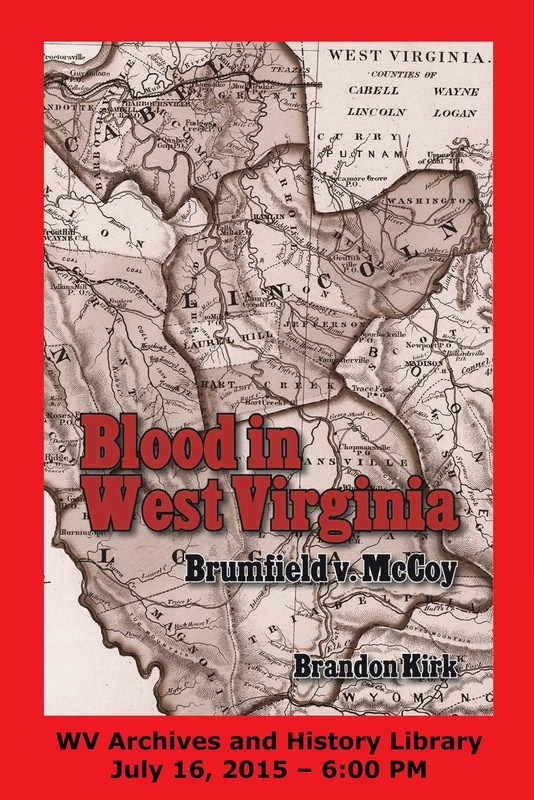 Tonight, I will present a lecture regarding the Lincoln County Feud at West Virginia Archives and History in Charleston, WV. This is a great honor. I could not have written my book without the vast resources of the state archives and its helpful staff. In the late summer of 1996, Brandon and Billy turned their genealogical sights on John W. Runyon, that elusive character in the 1889 story who seemed to have stirred up a lot of trouble and then escaped unharmed into Kentucky. They arranged a biographical outline after locating two family history books titled Runyon Genealogy (1955) and Alden Williamson Genealogy (1962). Then, they chased down leads at the Cultural Center in Charleston, West Virginia; the Wyoming County Courthouse at Pineville, West Virginia; the Wayne County Courthouse in Wayne, West Virginia; the Martin County Courthouse at Inez, Kentucky; and at various small public libraries in eastern Kentucky. Runyon had left quite a trail. John W. Runyon was born in February of 1856 to Adam and Wealthy (Muncy) Runyon, Jr. in Pike County, Kentucky. He was a twin to James Bertrand Runyon and the ninth child in his family. His mother was a daughter of James Muncy — making her a sister to Nellie Muncy and an aunt to Milt Haley. In other words, John Runyon and Milt Haley were first cousins. According to Runyon Genealogy (1955), Adam and Wealthy Runyon left Pike County around 1858 and settled on the Emily Fork of Wolf Creek in present-day Martin County. In 1860, they sold out to, of all people, Milt Haley’s older half-brother, Moses Parsley, and moved to Pigeon Creek in Logan County. John’s grandfather, Adam Runyon, Sr., had first settled on Pigeon Creek around 1811. The family was primarily pro-Union during the Civil War. At a young age, Runyon showed promise as a timber baron. John may have put his timber interests on hold due to new developments within his family. According to Runyon Genealogy, his mother died around 1878 and was buried at Peach Orchard on Nat’s Creek in Lawrence County, Kentucky. His father, meanwhile, went to live with a son in Minnesota. In that same time frame, on Christmas Day, 1878, Runyon married Mary M. Williamson, daughter of Stephen and Ellender (Blevins) Williamson, in Martin County, Kentucky. He and Mary were the parents of two children: Aquillia Runyon, born 1879; and Wealthy Runyon, born 1881. John settled on or near Nat’s Creek, where his father eventually returned to live with him and was later buried at his death around 1895. During the late 1880s, of course, Runyon moved to Harts where he surely made the acquaintance of Enoch Baker, the timber baron from Nova Scotia. An 1883 deed for Henderson Dingess referenced “Baker’s lower dam,” while Baker was mentioned in the local newspaper in 1889. “Enoch Baker, who has been at work in the County Clerk’s office and post office for several weeks, is now on Hart’s creek,” the Logan County Banner reported on September 12. Baker was still there in December, perhaps headquartered at a deluxe logging camp throughout the fall of 1889. After the tragic events of ’89, Runyon made his way to Wayne County where he and his wife “Mary M. Runyons” were referenced in an 1892 deed. Wayne County, of course, was a border county between Lincoln County and the Tug Fork where Cain Adkins and others made their home. He was apparently trying to re-establish himself in Martin County, where his wife bought out three heirs to her late father’s farm on the Rockhouse Fork of Rockcastle Creek between 1892-1895. In the late 1890s, John’s two daughters found husbands and began their families. On January 3, 1896, Wealthy Runyon married Clarence Hinkle at “John Runyonses” house in Martin County. She had one child named Hattie, born in 1899 in West Virginia. On March 29, 1896, Aquillia Runyon married Samuel W. Porter at Mary Runyon’s house in Martin County. They had three children: John W. Porter, born in 1897 in West Virginia; Aubrey Lee Porter, born in 1899 in Kentucky; and Izella Porter, who died young.